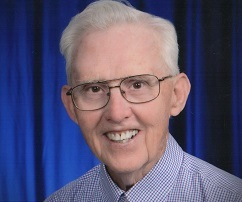 James “Jim” E. Mahoney, 81, of Geneva National in Lake Geneva, WI died Saturday, January 26, 2019 at Oak Park Place in Burlington, WI surrounded by his loving family. He was born May 1, 1937 in Dodgeville, WI son of the late James F. and Ann L. (Welch) Mahoney. He served in the U.S. Army from January 22, 1959 until January 27, 1963. On July 25, 1964 he was united in marriage to Hedy K. Zimmerman in Blanchardville, WI. Jim was founder of Heidi’s Cheese Products in 1976 based in Libertyville, IL which he owned /operated for over 30 years, retiring in 2006. Jim was a member of St. Patrick’s Catholic Church in Elkhorn, WI and Knights of Columbus council # 3464. He was an avid golfer belonging to Geneva National Golf Club, enjoyed taking daily walks, and had a keen interest in stocks, bonds, and investments being very involved with the local Vector Vest Club. Jim was a devoted and loving husband and father who will be deeply missed by his family who include his wife of 54 years, Hedy, his two children: Timothy Mahoney of Evanston, IL and Heidi Mahoney of Los Angeles, CA, his two sisters: Maureen (Stan) Shields of Palos Park, IL and Ann (Jack) Potter of Dodgeville, WI and his brother Bernie (Roberta) Rhinerson of San Diego, CA and by a host of other relatives and friends. Jim was preceded in death by his brother Michael Mahoney. Memorial Mass with military honors will be 11:30 AM Friday, February 1, 2019 at St. Patrick’s Catholic Church, 107 W. Walworth Street, Elkhorn, WI with Father Oriol Regales officiating. Visitation will be at the church Friday from 9:30 AM until time of Mass. On-line guestbook is at www.haaselockwoodfhs.com. Funeral arrangements were completed by Haase-Lockwood & Associates Funeral Homes and Crematory of Elkhorn, WI.